Aaron Bush, along with his fiancée, Alexis de la Rosa, is a co-founder, co-director, and co-emcee of Dr. Sketchy’s Baltimore. 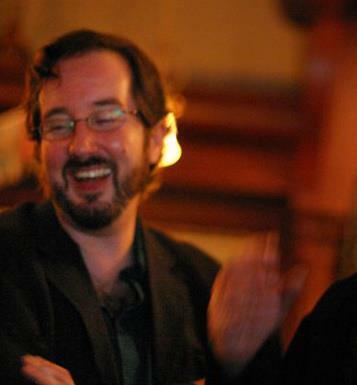 At the moment, he is currently working on a novel involving the history of Fells Point and magic (of the performing variety…mostly). I have a friend 88 used to do covers for romance novels…he has been painting out here on the west coast and has just moved to Maryland (Towson). 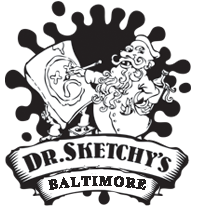 I will tell him about Dr Sketcheys he will love it! but, He is having no luck finding a studio to paint in. I told him I would put some feelers out, do you know of anyone who has artist studios? I think I sent you an email about this, but that might have been someone else…..in any case, try Googling “Meadow Mill” and “Clipper Mill”, though Clipper Mill will be expensive. Your friend will have much better luck with Craig’s List, and possibly even better luck by just checking out the community boards at couple local art supply shops. Hope that helps! Hi Aaron, I was curious about possibly using your sketch of boulders in a report. I would credit you, but can’t offer any payment. Please let me know by email. Thanks. Oh wait, this ain’t email is it…. We liked the post. We are avid lover of espresso and for someone who consumes numerous cups, the article sticks. We like your style of writing too! Great job! !